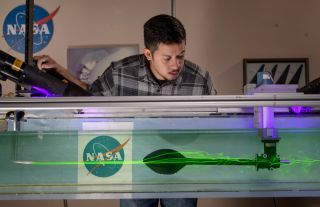 Student intern Joe Burces at NASA's Ames Research Center observes a football in a fluid dynamics chamber. Throwing a tight spiral to a receiver downfield isn't so different from trying to get a rocket to fly smoothly through the atmosphere. Or at least these tasks are similar when viewed from an aerodynamic perspective: Both present questions about how air flows over the surface of an object as the object is hurtled from one point to another through the atmosphere. In Ames' Experimental Aero-Physics Branch lab, scientists use a fluid dynamics chamber to recreate the conditions of an object flying through the air. The chamber has the bonuses of keeping the object in one place, and showing engineers the normally invisible motion of the air around the object. For example, using lasers and smoke, it is possible for scientists to see how the air curls and swirls as it flows off the back of a football, just as it might when the football leaves the quarterback's hand and heads toward the receiver. "What we are looking for in the smoke patterns is, at what speed the smoke patterns suddenly change," Rabi Mehta, chief of the Experimental Aero-Physics Branch at Ames, said in a statement. One of the major factors in determining how well an object flies through the air is the so-called "boundary layer" — a thin layer of air around the object that can act like a buffer, letting the air slide over the object and thus making it more aerodynamic, according to NASA. If the boundary layer is torn off the object, friction can slow down the object or cause it to wobble. "It is the state and behavior of that layer that is critical to the performance of the ball," Mehta said. "The materials used, the ball's surface roughness and its [weight] distribution determine its aerodynamics." A golf ball, for example, is dimpled for a very important aerodynamic reason: The dimples make the boundary layer more turbulent, which keeps it wrapped around the ball longer. A smooth golf ball loses its boundary layer faster, and only travels about half the distance as a dimpled ball, the statement said. A football isn't dimpled, but it is "shaped like a wing and more aerodynamic than a round ball, so the flow [of air] is very different," Mehta said. "When a quarterback throws the football, he ideally wants to throw a tight spiral with high rotation rate to help stabilize the ball as it flies through the air," he said. "This produces lower drag than a wobbling ball, so it will get there faster." These types of studies can also provide insight into why a baseball curves, or why a football punter should try to kick the ball so that it rotates around a horizontal axis. Smoke and lasers show the flow pattern around an Adidas Brazuca soccer ball at NASA's Ames Research Center. Mehta has spoken to athletes about the aerodynamics of the balls used in their respective sports, and says the athletes often seem to understand exactly what he's talking about. Even though they haven't studied aerodynamics in a lab, their experience on the field has taught them lessons about how a ball moves through the air. Talking to nonscientists about the aerodynamics of footballs and other sports equipment can also be a way to get them interested in science. "Sports provide a great opportunity to introduce the next generation of researchers to our field of aerodynamics by showing them something they can relate to," Mehta said.